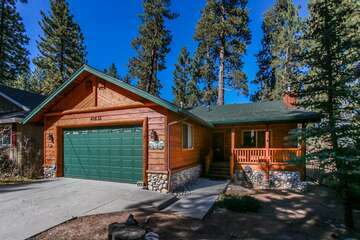 The fun and excitement continues in Pine Knot Village Big Bear Lake an area that was once home to lodges built for the up and coming ski crowds flocking to the Big Bear region of southern California, but is now a small-town community famed for being a shopping and entertainment mecca. 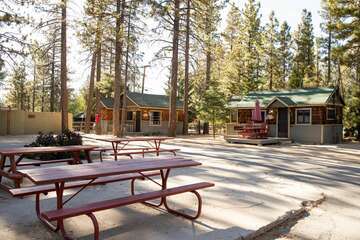 The best part of your Big Bear vacation is having the opportunity to experience small town life and the friendly people who are fortunate enough to live here year-round. In addition, you get to shop and eat some really good food! It’s one of our favorite areas; you really should stop by while you’re here! Featuring one of a kind boutiques that offer merchandise you can’t find just anywhere—including accessories for your fur babies and unique souvenir shops perfect for picking up gifts and surprises for the unlucky souls who didn’t have the opportunity to vacation with you in Big Bear—Pine Knot Village Big Bear Lake has a little something for everyone. The Dog’s Suitcase is especially cute, containing everything your pets might need for travelling with you on vacation; the custom-made mink collars they sell might be a little much, but isn’t your pup worth it? Vacations are about more than the destination. Some of the best vacation memories come from eating meals you may not have access to at home. California is known for its ethnic cuisine and seafood fresh from the sea, and Pine Knot Village Big Bear is home to some of the tastiest examples of both. La Bamba Mexican Restaurant serves spicy salsa that could have come straight from your Mexican grandmother’s cocina; we love their happy hour too! The Village Sweet Shoppe has sweet treats that you won’t want to share, but you kind of have to, unless you buy your kids their own! The Cave, our local comedy venue, offers top notch entertainment by some of today’s most famous comedians, as well as music fests and theatre performances. If you want to be entertained, this is the place to go! On November 27th, right after Thanksgiving, they will be screening the comedy Christmas special, National Lampoon’s Christmas vacation. There’s nothing like watching someone else’s Christmas disaster to make you feel better about your own! And finally, The Cave’s Friday night band series will have you tapping your toes and snapping your fingers along to the beat of some of the best groups in the area! 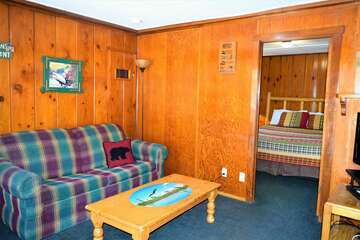 Book your rustic and romantic Big Bear Cabin today and discover the joys of Pine Knot Village Big Bear Lake. Don’t forget to leave room in your suitcase for all the souvenirs you bring back home.